Home » General Health » Oral Care » Can mouthwash give you a heart attack? Wake up, roll out of bed and head to the bathroom. Brush your teeth, floss and finish with some mouthwash. Stop right there! That last part in that sequence could be increasing your risk of heart attack, according to research. But before we uncover possible harmful effects of mouthwash, let’s examine mouthwash itself. Mouthwash is a fluid rinse for part of your oral hygiene routine. It’s meant to protect gums and teeth and comes in different varieties for different needs. There are fluoride mouthwashes, anti-plaque mouthwashes and desensitizing mouthwash – all to help improve your oral hygiene. Yet although these products are meant to better our health, alarming research is revealing mouthwashes heart attack risk. Published in Free Radical Biology and Medicine, British researchers revealed the link between mouthwash and heart attacks. Antiseptic mouthwashes were found to increase blood pressure between two to 3.5 points. Researchers noted that even a two-point increase in blood pressure translates to a 7 percent increase in heart attack risk. Furthermore, stroke risk also increased by 10 percent. In the study, 19 participants used an antiseptic mouthwash twice a day. Before and after using the mouthwash, participants’ blood pressure was recorded. 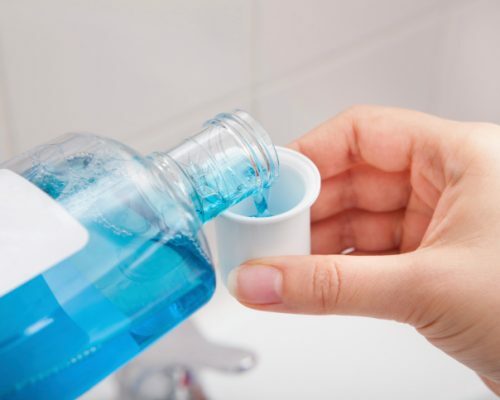 The main ingredient in many popular antiseptic mouthwashes is chlorohexidine and although it can kill off bad bacteria, it also kills off the good ones as well. When good oral bacteria are killed off, nitrite isn’t produced – the compound necessary for blood vessels to dilate. Blood pressure rises as a dangerous result. The participants in the study saw a decrease in nitrate production by 90 percent and blood nitrate levels dropped 25 percent. If you have blood pressure issues or family history of heart disease, you may want to steer clear of mouthwashes, especially those containing chloroxidine. Instead, why not use a natural approach to freshen your breath and promote healthy oral hygiene? It should protect from cavities. These are what you should consider when creating a natural mouthwash alternative; so choosing natural ingredients which can serve these purposes is ideal. Combine all ingredients in a pint-sized glass mason jar. Shake well to blend. Shake well prior to use. Swish in mouth for 30 seconds, then spit out. Store in glass jar on bathroom counter indefinitely. This makes about 16oz which should offer about 15 to 30 uses. 1. In a large glass mixing cup, stir together the calcium powder and xylitol crystals. 4. Pour mixture into a glass bottle (like an old apple cider vinegar bottle). Mix all the ingredients together in a bowl with a spout (liquid measuring cup works great). Then use a whisk to mix together. Pour into a bottle with the help of a funnel and shake to mix. This will store for two weeks in a dark, cool cupboard. Swish and spit morning and night. With these natural mouthwash alternatives you can enjoy the same benefits of store-bought mouthwash but without the risk of increased blood pressure and heart attack. Proper oral hygiene is important for overall good health so it’s important you take care of your teeth just as you would the rest of your body. Research shows bad oral care could lead to serious heart problems. The Royal College of Surgeons in Ireland and the University of Bristol in the United Kingdom have released a study that indicates a bacteria called, Streptococcus gordonii can cause blood clots and lead to heart issues if it enters the bloodstream. Brushing and flossing are good for your brain? Most people know the bare basics of dental hygiene. If you don’t brush and floss regularly, it can lead to a number of issues ranging from tooth decay to gum disease. However, there is a whole other area you may not have considered.